Damn. I just threw away a half-bottle of expired (by about 6 months) aspirin. Medscape is behind a registration-wall, but its not a pay-wall. its one of the better medicine related websites, though. 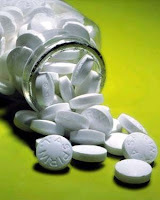 The problem with old aspirin is that it starts breaking down to vinegar. Acetylsalicylic acid --> acetic acid. But the "expiration date" imprinted by a manufacturer is much more about sales than pharmacology.